A joyous introduction to music and movement. Stretching class is strongly encouraged at these levels. In order for dancers to establish clean technique and good habits, other genres of dance are not introduced. (The exception is Character for Ballet 1A+ taking 2x+/wk.) SUMMER: 1-2 weeks of dance camp (Fairytale/Performance Camp) or Ballet Intensive A is recommended. 2-3 weeks required for pointe. Stretching class is strongly encouraged for these levels. 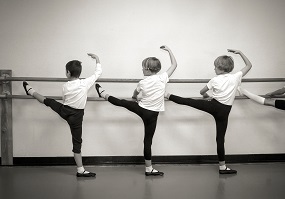 In addition to ballet technique, Character is offered to build versatility. Pointe/pre-pointe is introduced. Dancers also have the option to compete at Youth America Grand Prix (YAGP) if they take ballet technique class 3x/wk. 3x/wk or more is recommended for this level. SUMMER: 3+ weeks required for pointe. Stretching is recommended for these levels. Character and Modern classes are strongly encouraged to expand versatility. Power Pointe builds strength and stamina. Intermediate dancers usually have the option to compete at Youth America Grand Prix (YAGP) if they take ballet technique class at least 3x/wk. SUMMER: 3+ weeks of Ballet Intensive recommended. Stretching, Character, Modern, Jazz and Contemporary classes are strongly encouraged to expand versatility. Power Pointe is recommended to increase strength and stamina. Advanced dancers have the option to compete at Youth America Grand Prix (YAGP) if they take ballet technique class at least 4x/wk. Dancers must be proficient on pointe. SUMMER: 4+ weeks of Ballet Intensive recommended. Designed to complement classical ballet training, increase versatility, and familiarize dancers with other genres of dance. Recreational and therapeutic classes for a variety of populations in the community.